This 'hog beaut is not some retro timepiece; it's a different, punchier-sounding Taylor, fit for full pro duties. Tones, feel and build quality we've come to expect from Taylor. Hardwood top offers new sounds. 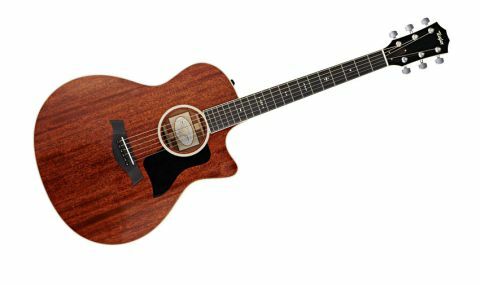 Taylor has used mahogany tops (and, of course, other hardwoods such as koa) before on limited-run guitars, but this year sees the first time that they have been used in the standard 300 and 500 series ranges paired with the mahogany-alike sapele on the former and tropical mahogany on the latter. Here we're looking at the 526ce - a mahogany-topped Grand Symphony-sized electro-acoustic. The guitar looks very workmanlike, not least with its 'hog top' and glossed body. Construction-wise, the 526ce makes a classy statement with its off-white-bound ebony-faced headstock and tasteful old-school 'Century' inlays. The 'board is bound with an off-white grained ivoroid, the same that's used for the body bindings and heel cap. "There's a very electric-like feel to the neck - in a good way"
There's a very electric-like feel to the neck - in a good way. It's consistently shaped with a subtle V to the profile that really loses the shoulder and almost fools your hand into thinking it's a thinner neck than it really is. Straight from the case, it's road-ready with fast but not ultra-low action. The Tusq nut and compensated saddle ensure spot-on intonation, and inside and out there's nothing to criticise. It has Taylor's slightly upturned round-nosed Florentine cutaway, too (a standard feature of the 500 series 'hog tops'; an order-only option in the 300 series), and of course, Expression System electronics with those low profile rubber controls on the upper shoulder for volume and centre-notched treble and bass. As a reference, Taylor provided us with a spruce-topped 514ce, which is a good place to start our listening test. There's that instantly recognisable modern 'produced' acoustic sound: crystal clear complex highs, seemingly scooped midrange and piano-like lows that, with the mahogany back and sides, never sound quite as 'hi-fi' as rosewood. "The lows especially feel stronger and punchier, the mids are thicker"
The mahogany-topped 526ce is noticeably different from the get-go. If the spruce is giving us this apparent harmonic complexity, the mahogany is more fundamental: the lows especially feel stronger and punchier, the mids are thicker. And the highs? Well, they're still crisp, but there's a little more power, certainly to lead lines, and a subtle rounded focus to the attack of the note. Like any acoustic pickup system, Taylor's Expression System has its fans and detractors. In some scenarios, the lack of onboard control - volume, treble and bass rotaries aside - can be an issue, so if you need more control (feedback rejection, additional EQ and, of course, a tuner) you'll have to do that outboard. With that caveat, the ES produces an excellent 'all-round' electro tone. There's a hint of Fisman's Rare Earth 'magnetic' tonality, but plenty of modern sizzle, too. You can also switch the body sensor off via a switch accessed through the soundhole, leaving just the sensor that's buried in the neck joint active. It proves handy to sort some feedback issues, but in most of the acoustic settings in which we've used Taylors, feedback seems under control and it might be more of a style/sound choice - the body sensor obviously adds more complexity and 'realism' to the sound, and the neck pickup alone sounds a little older. Importantly, you have a choice that's rarely offered by other mainstream makers. The output seems lower than some under-saddle systems, so swapping guitars can be an issue live. But sonically, like everything else about a Taylor, it's a thoroughly pro system. We hear through the grapevine that there will be revisions to the ES in 2014, but we'd still be very happy to step on the boards with any of these guitars. Also, for those of us recording at home where it's not always possible to use a mic, the ES is excellent direct in: very clean and balanced. As one of the world's largest and most consistent makers, when Taylor does something it's usually for a reason. The inclusion here, then, of a mahogany tops to its key ranges might seem a cynical bandwagon-jumping exercise - until you hear one. The more fundamental punchy voicings of this 'hog top', makes it sonically a very viable different voice. And if we're honest, it's a voice that's welcome if you find modern, ultra-clean and snappy electros a little ear-wearing. Of course, it still sounds, feels and plays like a Taylor. It's hugely reliable, stage ready, and while it might not appeal to vintage-ophiles, for the rest of us they are undoubtedly great playing and sounding, professional working instruments.